So as part of my duties as a member of the Antiquities Advisory Board, I traveled to Goliad earlier this week to attend a board meeting. While there I had the opportunity to take a moment to visit the 1894 Goliad County Courthouse. 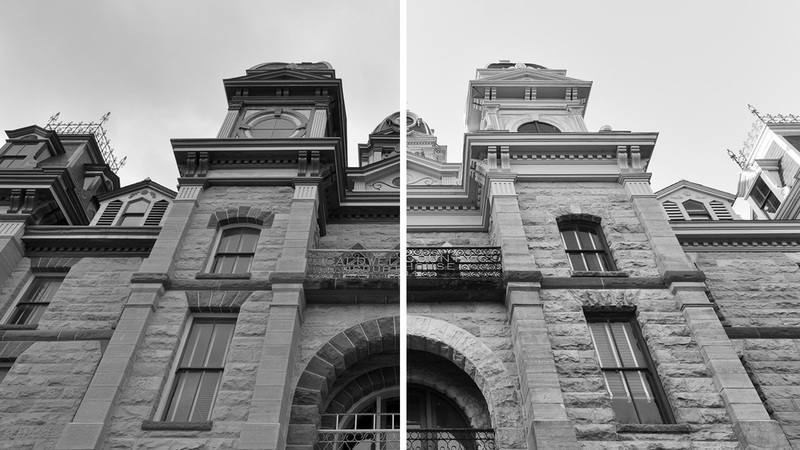 The building closely resembles the Caldwell County Courthouse that was built in Lockhart in the same year. As they were designed by the same person at the same time, it makes sense that they would be similar and from a formal standpoint they are all but identical. Even if the builders used the same set of drawings when they were building these two courthouses, they were doing so at a time when all architecture was handcrafted. Different materials were available in the different locations which informed the type of stone that was used. And the buildings have weathered differently as well. The main tower and cupolas of the Goliad County Courthouse were destroyed in 1942 and for sixty years the building remained decapitated. A 2002 restoration effort finally returned the structure to its original stature. Modernism did much to raise the bar on the quality of construction so that all buildings - be they single family homes or temples of justice - enjoyed a high level of performance. But that consistency can also lead to homogeneity. Although it may be convenient to walk into a Walmart anywhere in the United States and know exactly where to find a 12-pack of tube socks, it doesn't provide for a particularly rich environment in which to be. That may be fine for a Walmart, but the places where we live, work and learn should aspire to something more.